Some churches call their Sunday meeting a worship service. This has always troubled me. Yes, I knew that singing to God was a form of worship, or at least it should be. And I understood the part about “worshiping God with our tithes and offerings,” even though I didn’t see God getting too much of what we dropped into the offering plate. But the sermon? How could listening to a lecture, often a boring one, be a form of worshiping God? In truth, aside from a few songs and the collection, the bulk of most church services are either education or entertainment. Is that worship? I don’t think so. I hope not. Singing: As I said, singing to God is a way to worship him. More broadly, music is a path to worship. That means we can sing or listen to music. Music can also involve movement, rather it be clapping our hands, raising our arms in praise, or dance (from rhythmic swaying to getting down like David, 2 Samuel 6:14). Unfortunately, I’m musically and rhythmically challenged, so I struggle to worship God through music and movement. But give me a strong beat with catchy lyrics behind it, and I can engage in song as a means of worship. Serving: Helping others, both with our time and through our money, is a tangible form of worship. I enjoy the action of doing something for others, offering it as an act of service to them and as a form of worship to God. Silence: In our multitasking, always-on society, the hush of stillness is an anachronism to most, one that causes many people to squirm. Few people can tolerate silence for more than a few seconds. Yet in our silence—along with its partner, solitude—we can quiet our racing minds and still our thumping hearts in order to connect with God. Psalm 46:10 says to “be still and know that I am God.” Yet, setting time aside to be still presents challenges. For most of us, meeting with God in silence doesn’t just happen; we must be intentional. 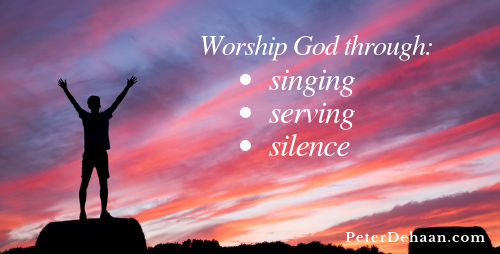 In my times of silence I connect more fully with God in worship, get deeper glimpses into his heart, and am best able to hear his gentle words of encouragement, correction, and mostly love. So good! Just as I make it my practice to attend church, I have a parallel practice of giving to my community each week. I also (usually) block out one day out of seven to fast, and part of that time includes worshiping God through silence. All three are forms of worship, though for me, helping others is more practical and resting in God’s presence is more meaningful. God has uniquely made us and gives us different ways to worship him. When it comes to worship, one size does not fit all. Find the one that fits you.